After Michael Collins, there was Henry Hayes. 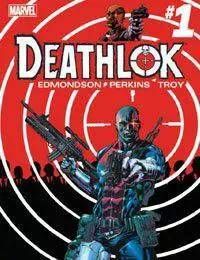 A medic who travels to war zones to heal the wounded, he has no idea that when he's in the field, he's activated by a mysterious group and becomes the ultimate weapon of assassination and war: DEATHLOK. From the writer of BLACK WIDOW and THE PUNISHER comes a new take on the iconic cyborg character making waves on Marvel's Agents of S.H.I.E.L.D.